There are so many ways women rule their domain with grace and with wisdom. One of these ways is saving money through the art of deals! I love a good deal and I enjoy the hunt for the perfect bargain - most of the time - sometimes I just want shorts to be on sale ONE time during the summer. Otherwise, I usually have a catalog of wants and needs and wishes in my head and when I see a deal - I strike. Sometimes I need to take a break, because deal overboard = not saving money. Black Friday - yes. I go out every year and I love it. I can get jeans I love for 60% off and I scored a whole Paw Patrol set for $17 at Kohls (those pups individually are around $10!). Day after Christmas - yes. I got out every year right after Christmas and snag all the goodies that are marked waaay down because Gap stocked one too many scarves. And those temporary kiosks in the mall - you can get board games, calendars, meats and cheese - for such a low price - hello New Years! Those two shopping days are smooshed at the end of the year. Where's the great summer blow out? Where are the summer deals? Glad you asked my friend. Amazon Prime Day is a real day - actually this year it's a real 30 hours of deals. Some smokin' good deals. Black Friday and better deals. And you can do all the shopping at home with peanut butter and crackers in your hair (because kids) and the same shorts you've worn for three days, because they just get stretchier. 1. First you need to have an Amazon Prime membership. There are a million perks to Prime - a few are free 2 day shipping on most items, free movies/TV shows (think Netflix), and access to deals like Subscribe and Save (where you can get up to 15 - 20% off certain items) - I personally use Subscribe and Save every month to save on diapers and household items. Not a Prime Member? Try it out for a whole month for only $3! If you're not signed up for Prime, start making those Christmas lists for your friends and family and get your book wish lists ready - there is no better time to try Prime than the month of July with Prime Day. You get the same deals during your trial. Woo! 2. Prime day is Tuesday July 11th - all you have to do is shop till you drop on amazon. 3. Deals are posted throughout Prime Day. Some deals expire when they are sold out. New deals pop up throughout the day. Have a list of things I need (think kitchen items and appliances, electronics (TVs, Computers), clothing items, shoes for kids (the never ending peril), birthday/wedding/Christmas gifts, and my book wish lists. *** It looks like you can make a wish list this year and Amazon will notify you if they go on sale! Totally doing this! I look at Amazon Prime Day deals - just a quick scroll through to see if anything meets my list. These are called "Lightening Deals" and on Prime Day there will be a higher volume. 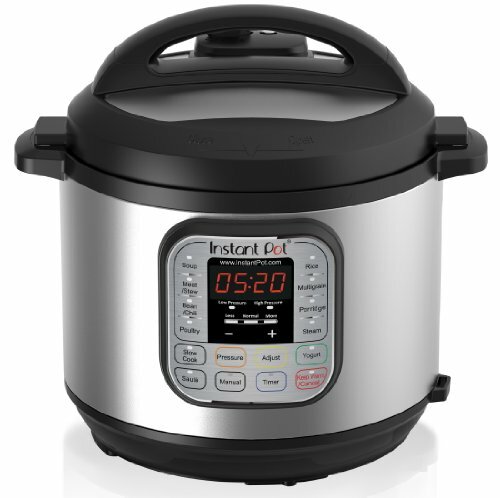 Last year I scored my Insta Pot electronic pressure cooker for $58! My insta pot hard at work - perfect rice and quinoa in 12 minutes; spaghetti squash in 9 minutes; perfect tender and flavorful soups in 30 minutes. That was by far my favorite prime day score and I've used it to cut down cooking times and sweat in the summer (because the oven is HOT). What are some things on your Prime Day list?